The past two months were busy for trailwork, but currently nothing is upcoming. 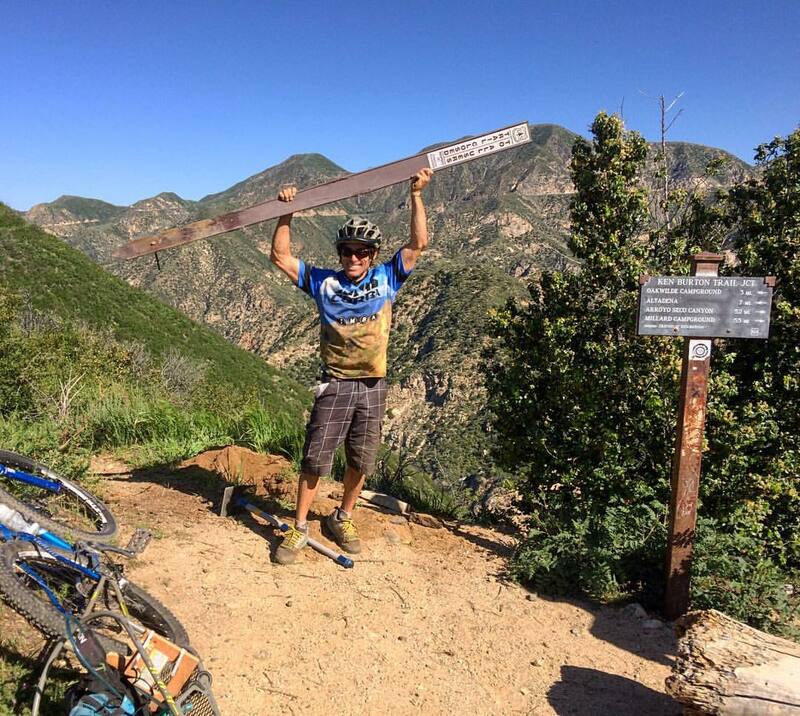 Santa Monica Mountains Trail Days in Pt Mugu State Park, April 23-24. On Saturday morning, 140 volunteers split up into crews of about 10 and dispersed to various trails. The crew that included most of CORBA’s volunteers shuttled to the top of the Sin Nombre Trail and started by cutting back mustard that was crowding the first 200'. Next, we worked our way south, fixing deep ruts. The north end of the Sin Nombre trail is very rocky in sections, so it took a considerable amount of work to restore the trail to it’s original condition. While the CORBA crew was working southward, two other crews were working up from the bottom of the trail, fixing ruts. A crew consisting of mostly MBU members and led by Steve Messer, CORBA’s president, worked their way up the Wood Canyon Vista Trail. They started by rebuilding the first very tight switchback which had become rocky and difficult to navigate. Next, they headed up the hill to generally clean out old drains and build new ones where needed. 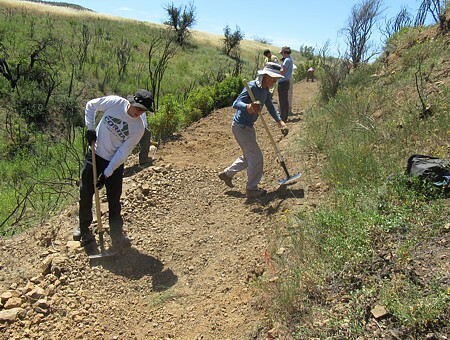 Other crews worked on Sage Trail, rebuilding walls and drainages, Old Boney Trail near Sorreno Valley in the Boney Mountain Wilderness Area, and a group of youngsters and their parents cleared brush from the side of the Blue Canyon Trail. 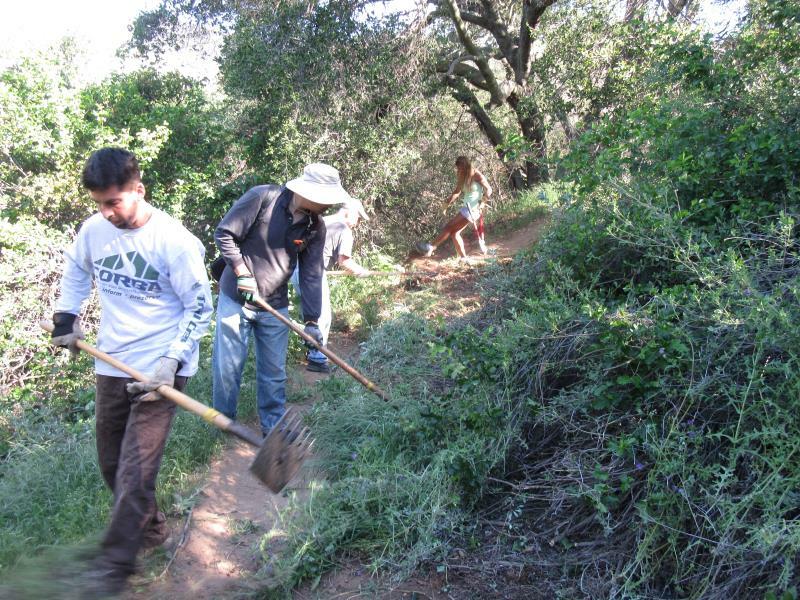 A Sierra Club group worked on Coyote Trail. You can see the full report, including a photo gallery, on the Trail Days Report blog. Completion of the Ken Burton Trail, April 17. Thirty-two volunteers converged for the last trailwork day on this restoration project, which began in earnest last Fall. In October, Steve Messer declared that all the tools hauled up to the top of Brown Mountain would not come back down the same way. They’d be going out the bottom of the trail and the Gabrielino, once the trail was finished. On this Sunday, the tools were brought out of the bottom, as pledged. While we’ve been working on the Ken Burton for just six months, more than two years of planning and pre-requisite projects have taken place. On Sunday we had a long list of tasks to finish Ken Burton trail. With so many volunteers to help, we completed: the complete rebuilding of three switchacks; widened and cleaned up three additional switchbacks; re-cut bench on a quarter mile of trail; rock-armored two switchbacks; installed a half-dozen drains; rock-armored and rebuilt two major washed out drainages; cleared brush from the upper trail that had grown in since we worked on it six months ago; and cleared additional brush and poison oak near the bottom. You can see the full report and photos on the Ken Burton Restoration Project blog. Backbone Trail from Kanan Road, April 2. We had planned to work on the Grasslands Trail in Malibu Creek State Park, but State Parks wasn't ready for us yet, so we moved the workday to the Backbone Trail. Our small group of five (4 mountain bikers and one trail runner) got a lot done, and along with the dozen or so volunteers from our partners with the Santa Monica Mountains Trails Council, we worked about a mile of trail, starting on the top of the tunnel just past the first steep hill out of the parking area. The poor turnout of mountain bikers was a real disappointment, especially because this is such a popular trail for mountain biking. There were three major problems that we needed to address – lack of drains, poorly constructed drains and overgrowing brush that included a lot of poison oak. The CORBA crew hiked about 1.4 miles to the end of the work area to tackle a corner where there have been mountain bike spills. The brush had overgrown the inside of the turn so that the trail had become very narrow and people were riding beyond the outside edge where the dirt was soft. Mixed in with the overgrowing brush were some very vigorous poison oak bushes. We carefully chopped, hacked, chopped and hacked the brush so that we would avoid contacting the poison oak. Then we raked the dead leaves and branches off the trail and finally, worked the dirt to give the tread a bit of an outslope (to shed water) and to make it even with the old trail. That effort took the five of us about an hour and a half. After that, we worked our way back to the beginning, rebuilding blocked drains, filling a few very nasty but short ruts, and building new drains. You can see the full report on the Kanan Backbone Report blog. 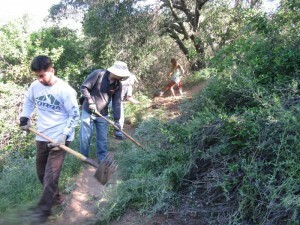 Conejo Open Space Spring Trailwork Day, May 19. Although we didn’t have to repair humongous El Nino rain damage that we were expecting, we still had ruts to fix that had been growing for years. 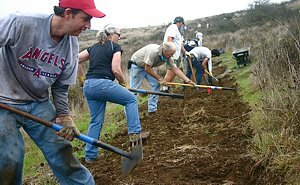 About 40 people volunteered to help work on trails. We split into two groups, about 15 working on the bottom of ‘Space Mountain‘ (the singletrack section of the Los Robles Trail West) while the rest went to the ‘Lily Tomlin Trail’ which connects the East and West halves of the Los Robles Trail. Space Mountain is CORBA’s adopted trail and we’ve worked it a number of times in the past, but then we started higher up and worked our way down. The work consisted of filling in ruts, restoring the trail outslope so water would run off it rather than down it, and building drainage nicks. On Space Mountain, we restored most of the first 1500' of trail. The soil was perfect – moist and easy to dig and pack, and there was a low cloud cover to keep the temperatures cool. 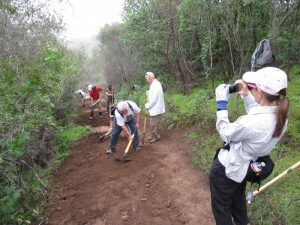 You can see the full report on the Spring Trailwork Day Report blog. National Trails Day is fast-approaching: June 4, 2016. It’s a day to recognize the important role trails play in many of our lives, and to spread the word about how trails benefit communities, and to encourage more people to venture out onto trails. Each year there are a number of events planned by land managers around National Trails day. 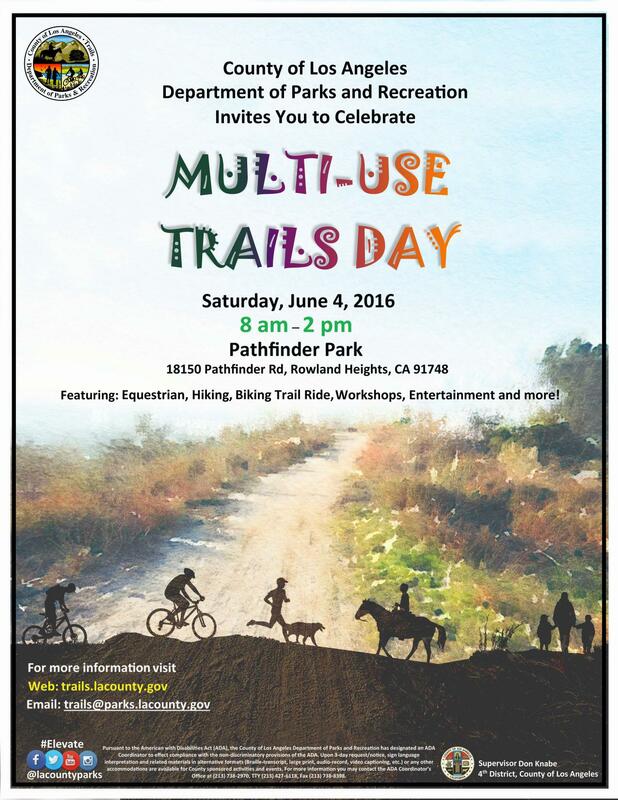 Los Angeles County is promoting an event to bring together all trail users in a Multi-Use Trails Day event. 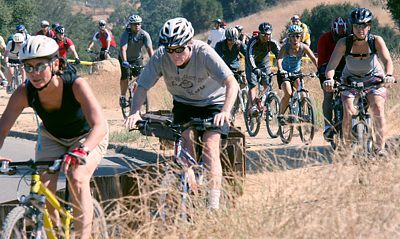 Equestrians, hikers, and mountain bikers will converge on Pathfinder Park in Rowland Heights to learn about trails, trail etiquette, and to enjoy the Schabarum/Skyline Trail. While the main route is about 4 miles, there are several options for longer rides or hikes. The free event will include vendors, lunch, and a raffle including a new mountain bike. On the other end of CORBA’s territory, the National Park Service will be holding its Centennial celebration. The Santa Monica Mountains National Recreation Area is currently working on the last two segments of the Backbone trail, a continuous 65 mile route traversing the Santa Monica Mountains. Much of the Backbone is open to bikes. They are working hard to complete the last two segments before the June 4th event, and to submit the Backbone Trail for inclusion in the National Recreation Trail system. CORBA will be at both events. Watch our Meetup group calendar for more details, and join us at either event to help celebrate the trails that bring us all together.